SnapRack offers the finest E-track based solutions for all your storage and cargo needs! Many of the items featured on this website are covered by the following US Patents #6364141, #6675980 and #6729485. Other patents pending. 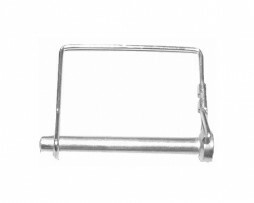 This sturdy steel D-ring creates a stable tie-down point in your trailer or truck bed. 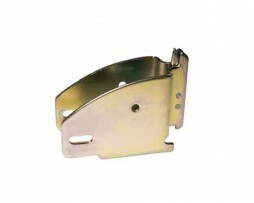 Recessed design lets you roll cargo over the D-ring without interference. 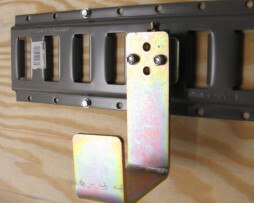 Installs easily with the included backing plate and hardware. 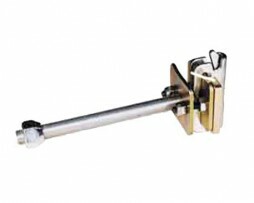 The Backpack Blower Bracket is a unique bracket designed to secure backpack blowers in your trailer. The bracket snaps in and out of place in seconds. Comes with release lever for secure install/uninstall. Bracket houses bungie cords to secure your blower. 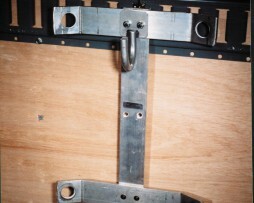 Beam pockets can be easily added and adjusted along your E-track system to create load bracing or shelving. Available in regular or heavy duty. Regular 2×4 lumber fits in pocket. Great for weed trimmers, chainsaws, leaf blowers, and many other uses to keep your cargo off the ground and secure. Snap in and out in seconds. They won’t come out unless the release lever is pulled, and can be rearranged quickly, without tools. Great for weed trimmers, chainsaws, leaf blowers, and many other uses to keep your cargo off the ground and secure. 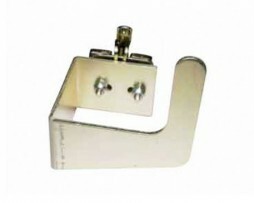 Additional bracket with bungee to secure your item. Use a hook to hang a blower, then use this hook to hold the extra tube. 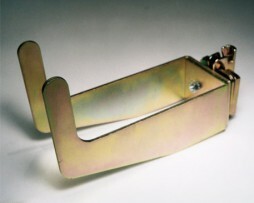 Formed steel, with a zinc plated finish. 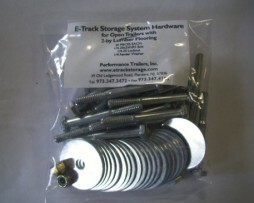 E-track 1 3/4″ Floor Hardware Package of (20) for installing e-track to floor of open trailer. 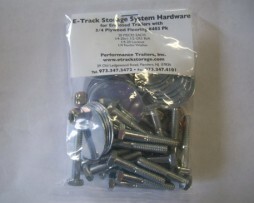 E-track 3/4″ Floor Hardware Package of (20) for installing e-track to floor of enclosed trailer. 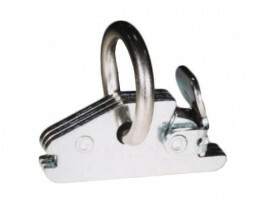 The flat drop hook is ideal for storage of leaf blowers, backpack sprayers, or other heavy duty equipment. Works well in conjunction with our Blower Tube Hook (#208). 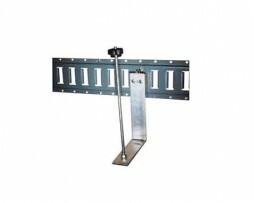 Allows you to move tie-down points quickly and easily. Handy accessory for your E-track system. 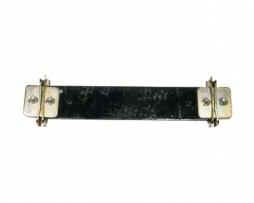 Tie off straps can be easily added and adjusted along your E-track system. Provides anchor points where you need. Attach tie downs, ropes, chains and other securing supplies. The E-track system is fully adjustable and allows you to create your own tie down system anywhere. Tracks are 4″ wide and feature cutouts that run vertically. Available in 5 ft. and 10 ft. tracks. Useful for storing cords, hoses, etc. 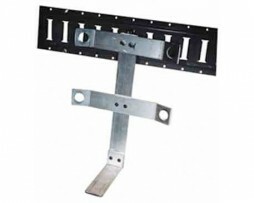 The Low-Profile wheel chock can be bolted down or mounted into E-Track, allowing it to be removed or repositioned. $40 for low profile wheel chock as bolt down installation, or $60 with 4 x E track clips attached, to allow fast snap in, snap out installation. 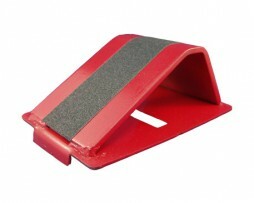 Wheel chocks snap into track allowing fast, secure mount, dismount and repositioning. 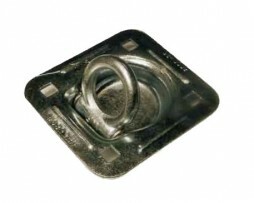 Wheel chocks can be positioned side to side in 2″ increments. 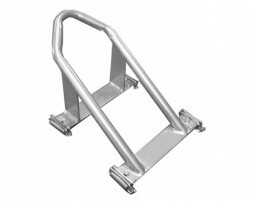 8″ of handlebar stagger is provided by installing wheelchock in either front or rear position. 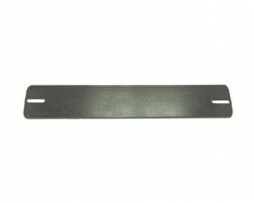 Available as a low profile wheel chock assembly or purchase adapter plates only to drill and mount to your own wheel chocks. 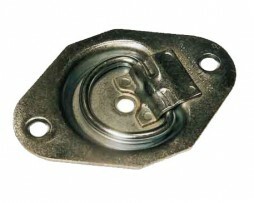 If you already own another brand or type of wheel chock, you can bolt or weld your chocks to these adapter plates to provide fast easy attachment to E-Track. 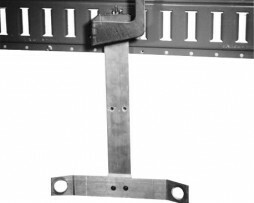 Plates must be end-mounted to provide adequate angling for track insertion (cannot be center mounted). For use with 3.5″, 5.5″ chocks. Patented design holds 3 to 4 shovels, rakes, hammers, brooms, and other handled implements. Also a great way to hang a hose, extension cord, beach chair, etc. 7-1/2″ long x 2-3/4″ wide. 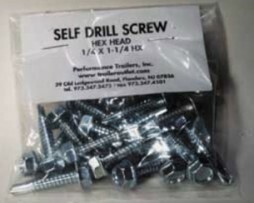 Self Drilling Tech Screw package of (25). 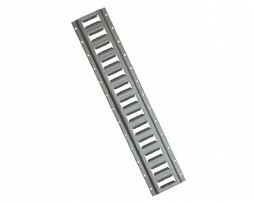 Use to mount e-track to wall of steel frame trailers. 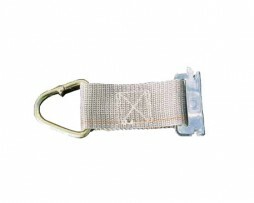 Track clip is sewn to nylon webbing, with a triangular tie off ring. Handy accessory for your E-track system. Great all around hand-it-up hook. Works well with popular brands of backpack blowers, as well as holding cords, ropes or as a coat hook. Super-fast repositionable/removable tie down system for quads & other vehicles. Snaps into E-Track/SnapRack Track. 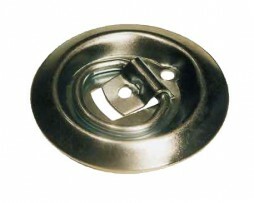 Car trailer wheel stop. 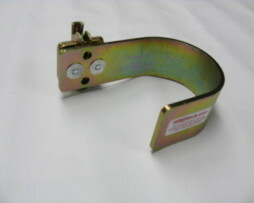 Includes E-track hold down ring. Track clip attached to a 1/2″x24 thread per inch bolt comes with a 13/16 lug nut 3-1/2″ long. Use the same lug wrench to change your wheels and access the spare tire. If you are using only one adapter plate, use a stabalizer plate on the other end of the wheel chock to balance the wheel between the two plates. 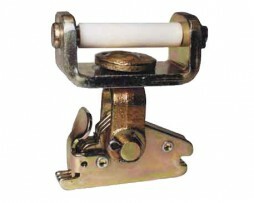 Snaps into E-track and secure strap via roller. Rotates vertically and horizontally to fit your needs. Add extra holding power to your trailer, van or truck with Surface Mount D-Rings. 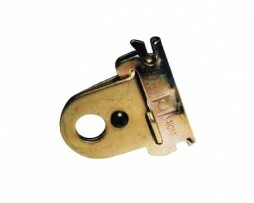 The D-rings are perfect for light-duty loads that weigh up to 1,200 lb. Great for light-duty cargo loads of up to 1,200 lb. 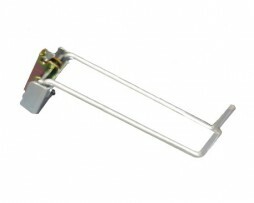 String trimmer line holder keeps your string trimmer line organized and handy. Also useful as a paper towel holder. Features a unique bracket that snaps in and out in seconds. Won’t come out unless the release lever is pulled, and can be rearranged quickly without tools. 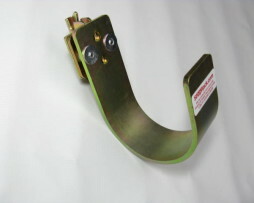 Water cooler bracket gets your water coolers off the ground and frees up space. Secure cooler with bungies. 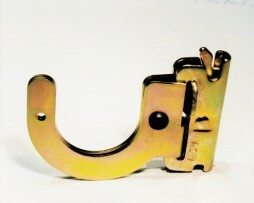 Features a unique bracket that snaps in and out in seconds. Won’t come out unless the release lever is pulled, and can be rearranged quickly without tools. 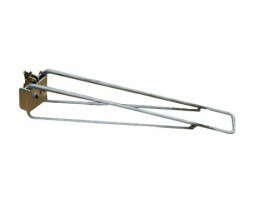 The wire hook can handle shovels, rakes, hay forks, brooms and other handled implements. 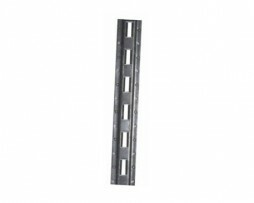 Easily create adjustable shelving connected to your E-track system. 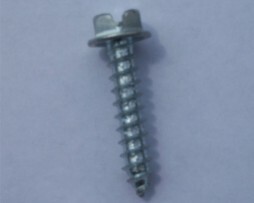 Package of 25 wood screws used to mount E-track to wall of aluminum frame trailers. Copyright © 2017 - Performance Trailers Inc.
Patent Infringement will be prosecuted to the fullest extent of the law. The patent allowed items are covered by an Intellectual Property Insurance.